According to Ohio Bobcats (4-2, 1-1) head football coach Frank Solich, the Green and White played two good quarters of football last week in its loss to the Central Michigan Chippewas (3-4,2-1). In MAC play that does not lead to a winning formula, especially when all three phases – offense, defense and special teams – aren’t clicking when the team needs them to. Ohio quarterback Tyler Tettleton (offense) and safety Travis Carrie (defense and special teams) are the ultimate captains, glue to the puzzle and question that Ohio has yet to figure out: Can this team consistently play team football? “There’s a high expectation to be able to finish games off, but we need to learn more how to start games and play early and not let things come down to the end,” Solich said. Carrie and Tettleton, captains and veteran leaders of the Ohio Bobcats, have been in every type of game situation there is. Think back to last year when the No. 24 ‘Cats lost an away heartbreak to rival Miami RedHawks 23-20. The recent 26-23 loss had many similarities (besides the plethora of penalties Ohio compiled against Miami) with the 2012 loss against Miami that happened before Ohio’s throttling of Eastern Michigan last season. The MAC may be the biggest wildcard conference in the NCAA, and that’s no joke. “We’ve faced every defense imaginable, and we always get a new look every week,” Tettleton said. That’s why Ohio needs to play cautious football against the Eastern Michigan Eagles (1-5, 0-2) this Saturday if they want to avoid being on the sour end of an upset. The problem isn’t that Ohio can’t get off to hot starts because the team often drives down the field and wears out defenses with its fast-paced, spread offense. Building on the momentum is what the ‘Cats need to work on to hold on to their prior success on first drives. What may slow down the Bobcat offense from doing so is the Eagles secondary, which ranks third in the MAC in total pass defense, giving up 200.3 yards per game (Their rush defense, however, ranks 12th in the conference). There are no standout explosive players for the Eagles in the secondary, but they’re definitely disciplined. “They’ve been in the system for a while and they know what they’re doing, so we’re facing a team that is hungry to find a win and get things running for home,” Tettleton said. Eastern Michigan, at the moment, is still scheduled to play Ohio despite the investigative homicide of junior wide receiver Demarius Reed, emotions will be all over the map regardless. If the two teams do end up playing on Saturday, look for the Eagles to come out with a lot of passion burning within them. The grind for a first MAC title birth, however, still thrives in the veins of veteran Bobcat players. Keeping emotions in check – With the recent death of Reed, Eastern Michigan will be fielding a different team on Saturday. By that, I mean emotions have a lot to do with the mental aspect of any aspect of life. A football team is like a family, and the Eagles will be trying to make a metaphorical casket of their own for their fallen teammate. It’s going to come down to who can stay calm on offense when protect breaks down, and I still think the ‘Cats have the advantage. Offensively: QB Tyler Tettleton – The Bobcats have been able to score on their first possession four of their last five attempts, so the problem with the Ohio defense lies in Tettleton continuing on building momentum. 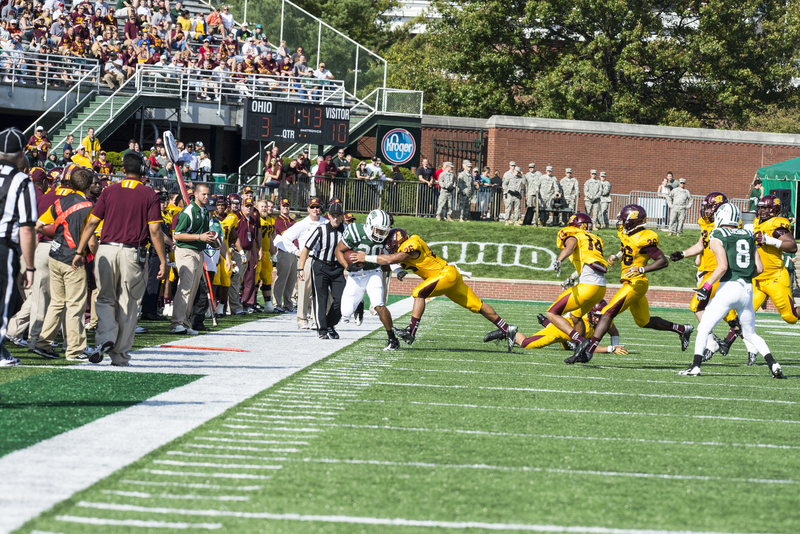 To finish of the game against Central Michigan, Tettleton finished the game 24-of-33 for 319 yards and two touchdowns. If he can avoid back-to-back three-and-outs, the ‘Cats can put a real pounding on the Eagles. Defensively: LB Keith Moore – After coming back from an ankle injury he suffered in the season opener against Louisville, Moore came back against CMU to record a team-high 10.0 tackles. Moore’s absence wasn’t noticed much because of the depth at linebacker, but having a captain and backfield monster back on the field only means that this already-underrated Bobcat defense becomes better. Offensively: RB Bronson Hill – The Bobcats kept Hill out of the end zone last season at Peden Stadium, but he did manage to carry the ball 25 times for 121 yards, shredding Ohio with a 4.8 yards per carry average. We’ve seen how good the Bobcat run defense can be because they still rank first in the league at 139.7 per game, despite giving up 184 yards on 26 carries to Saylor Lavallii this past Saturday. But Hill will be one of those “problem” backs in the MAC for Ohio. 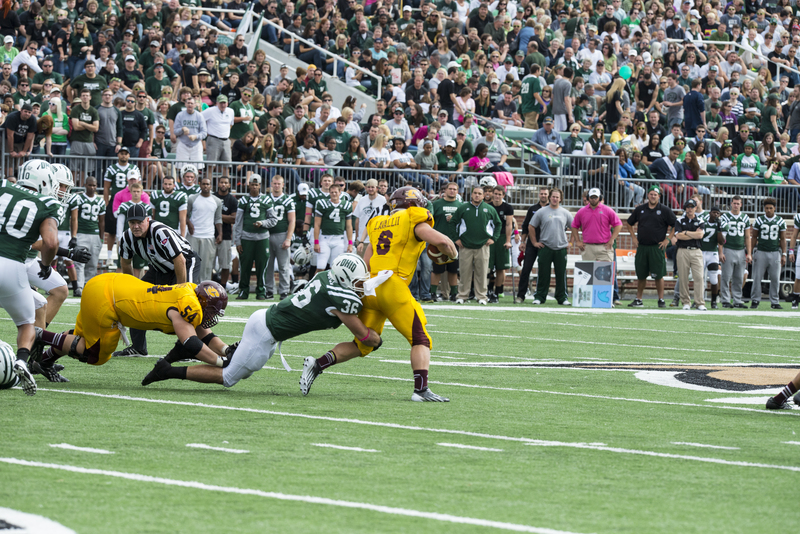 Defensively: DE Pat O’Connor – O’Connor ranks sixth in the MAC in total sacks, compiling four this season. The problem is, Eastern Michigan ranks in the middle of the pack in the MAC in sacks. Ohio has given up a fourth-best five sacks in the MAC, averaging less than one quarterback backfield drop per game. O’Connor will be the guy to cause trouble for Tettleton, but he seems to be the only weapon viable of stirring things up for the Ohio offense. Bobcats 29, Eagles 14 – The thing that everyone is saying about the ‘Cats is that they are struggling out of the gate, but they have scored on four of their initial drives out of five attempts. I still think this is a problem, but the three phases kick in for Ohio and the Bobcats come out victorious thanks to a shutdown secondary. Right now, the police are investigating a homicide. Reed was found early this morning by his roommate at University Green Apartment. Police say they saw multiple gun wounds on Reed according to reports but everything is still at an investigative stage at this point. The junior wide receiver Reed had compiled 44 catches for 474 yards and four touchdowns during his career for the Eagles. Reed was a starting wide receiver for the Eastern Michigan Eagles…stay tuned here and at @SportsSpeakeasy for more news on Reed.